Passengers are welcome to board our ship at 6:00 p.m. in Venice. After comfortably settling into your cabins, we'll introduce our crew at a welcome cocktail. The evening is free to do as you please. We'll spend this morning cruising to Chioggia. In the afternoon, join us on an excursion for both packages: Guided tour of Padua, the town of St Anthony of Padua. We'll return on board in Taglio di Pô(1). If you do not choose to go on the excursion to Padua, a transfer is established to the famous resort of Sottomarina. There you will have some free time to enjoy its beautiful promenade by the sea (possibility of bathing) or the city center. We'll then drive to Taglio Di Po where we'll return on board for an evening of entertainement. Join us on an excursion for both packages : Guided tour of Ferrara. DISCOVERY: Verona by bike and the Giusti Gardens, one of the city's marvels. Afterwards, we'll return on board in Polesella before cruising towards Taglio di Pô. This morning, join us on an excursion for both packages to visit the lagoon islands of Murano and Burano. Enjoy a free afternoon to explore Venice on your own or perhaps take an optional gondola tour (must be reserved and paid for on board.) Tonight is our gala dinner and evening. 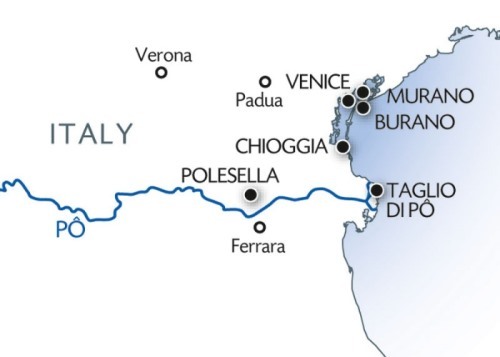 Cruise with your family on the river Po, the heart of Veneto. You will visit Verona, the city of Romeo and Juliet, but also the Giusti Gardens, and not forgetting we will take you to Arqua Petrarca, a city that has preserved its medieval appearance and the memory of François Petrarch, a reference to the Renaissance. You will also be able to admire the islands of the Lagoon: Murano, the island of glassblowers, and Burano, the island of colors and lace. (1) Passengers cannot stay on board during navigation between Chioggia and Taglio di Pô nor the opposite direction.